"Here, on fine, long legs, springy as steel..."
Born in Ames, Iowa, in 1939, Ted Kooser spent 35 years in the insurance industry, earning his Master of Arts Degree from the University of Nebraska and writing poems every morning before he left for the office. Now one of the country's most highly regarded poets, he is widely admired for his simple, straightforward style and the discovery of beauty in ordinary things. Poet and critic David Baker wrote, "Kooser documents the dignities, habits, and small griefs of daily life, our hunger for connection, our struggle to find balance in natural and unnaturally human worlds." To help bring poetry to a wider audience, Kooser has created the American Life in Poetry project. This free service provides newspapers and Web sites with poetry by contemporary American poets, and includes descriptions of the poems by Kooser himself. 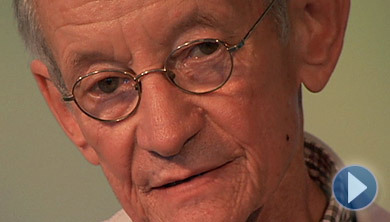 Kooser served as United States Poet Laureate from 2004 through 2006 and his many honors include a Pulitzer Prize in 2005 for his collection of poems, Delights & Shadows, a Pushcart Prize in 2003, and two National Endowment for the Arts fellowships. Having retired from insurance work in 1999, Kooser is currently a Presidential Professor of English at the University of Nebraska at Lincoln. To read this and other poems by Ted Kooser, as well as biographical information about the poet, please visit the Poetry Foundation Web site.